“I just wanted to write and thank you for making our wedding the most fun night of our night. I really appreciate you getting Randy to do the job and he was awesome. Everyone loved him and we were so happy with the job that he did. People danced the entire night and more importantly, I danced to every song! Please let Randy know how much we enjoyed having him and thank him for making our night so great! 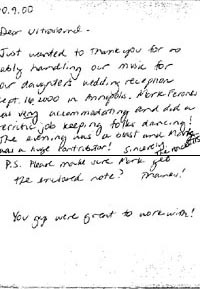 "Steve and I want to thank you for doing such a great job at our wedding reception back in April 16th. Mike was perfect and kept us all entertained and dancing. Everyone enjoyed themselves [mostly us :) ] and said it was one of the best ever. Thank you for making our day memorable!" 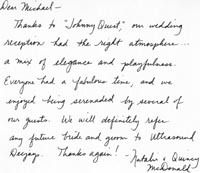 "Thanks to 'Johnny Quest,' our wedding reception had the right atmostphere... a mix of elegance and playfulness. Everyone had a fabulous time, and we enjoyed being serenaded by several of our guests. We will definitely refer any future bride and groom to Ultrasound Deejays." "Ultrasound Entertainment has earned the right to be called the best d.j. service in the area. Ultrasound was a huge reason our wedding reception went exactly as we envisioned it. We were looking for a d.j. who let the party have its own flavor as opposed to the typical canned-approach ro receptions. Our wedding certainly did not have the stereotypical reception of line dances or hokey-pokeys. It was a party that lasted well into the night and always with a crowded dance floor. The d.j. stuck to his word of accepting requests as long as they were not on the "do-not-play" list. No cheese here, either. The d.j. was inconspicious but kept the party moving. He continually checked in with us to make sure that we were having a good time. His professional demeanor and style enabled us to rest easy that we would have the party that we were looking for. SO many defining momments of the night, including a personal favorite of Lee Greenwood's God Bless the USA. In this time of national tragedy, a wedding should be cause for celebration and our d.j. allowed that to happen. The whole room erupted in a sing-along to the chorus and it really capped of an amazing night. 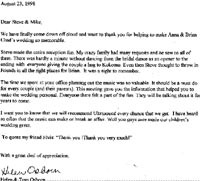 "Just wanted to thank you for ably handling our music for our daughter's wedding reception Sept. 16, 2000 in Annapolis. Mark Ferones was very accommodating and did a terrific job keeping folks dancing! The evening was a blast and Mark was a huge contributor!" "P.S. Please make sure Mark gets the enclosed note? Thanks! You guys were great to work with!" 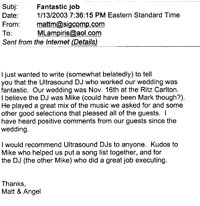 "Thank you for providing the perfect DJ for my wedding. He played all the songs we went over and asked me if it was okay to play others. He truly did a fantastic job." "I just wanted to thank you for helping to make mine and my husband's wedding a great success. Your agreeability in working with me long distance was great. The musical selections the DJ Mark brought were exactly what Bill and I were looking for. We had a ton of compliments on what a blast the reception was. Ultrasound DJ's played a significant role in that!" "Raj and I want to thank you for doing our reception on such short notice. We appreciate you setting up early and the DJ, Mike, was exactly what we wanted. He played good songs and didn't try to be an MC on the microphone. His little skit during "Shout" was funny, too. Thanks again and we will definitely refer you to anyone we know who is looking for a DJ." "We have finally come down off cloud and want to thank you for helping to make Anna & Brian Chad's wedding so memorable. Steve made the entire reception fun. My crazy family had many requests and he saw to all of them. There was hardly a minute without dancing from the bridal dance as an opener and the ending with everyone giving the couple a hug to Kokomo, Even then Steve thought to throw in Friends in all the right places for Brian. In was a night to remember. The time we spent at your office planning out the music was so valuable. It should be a must do for every couple (and their parents). This meeting gave you the information that helped you to make the wedding personal. Everyone there felt a part of the fun. They will be talking about it for years to come. I want you to know that we will recommend Ultrasound every chance that we get. I have heard so often that the music can make or break an affair. Well you guys sure make our children's wedding great. To quote my friend Elvis: 'Thank you! Thank you very much!'" 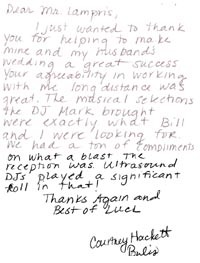 "I just wanted to write to tell you that the Ultrasound DJ who worked our wedding was fantastic. Our wedding was Nov. 16th at the Ritz Carlton. [The DJ] played a great mix of the music we asked for and some other good selections that pleased all of the guests. I have heard positive comments from our guests since the wedding. I would recommend Ultrasound DJs to anyone. Kudos to Mike who helepd us put a song list together, and for the DJ who did a great job executing." "I want to thank you for making Dawn & Baron's wedding day so special. Randy did a GREAT JOB. Everyone had a wonderful day. " "I just wanted to send you a quick thank-you from Cristina & I. Mike, we met with you a few days before our June 21st wedding. Our reception was a blast and the DJ you all send, Mark, was GREAT! I had heard so many horror stories about DJ's at weddings not playing the music the bride and groom had selected and not following the timeline of the evening. Mark was excellent and we are appreciative as well to both of you for working with us over the past months and sitting down to meet with us before our wedding. We really enjoyed that. I don't know of any other places that take the time to sit down and really get to know the bride and groom. My sister spent a lot of time picking out songs she wanted played at her wedding, and the DJ pretty much played whatever he felt like. Mark was great. He interacted with our friends and family and made Cristina and I feel very relaxed because we could tell he was in control. Anyway, just wanted to say thanks guys. You played a big role in making the biggest day of our lives extremely special. Keep up the good work, and thanks again for everything!" 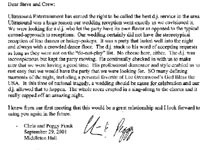 "Thank you so much for dj-ing our wedding on 7/12. We had so much fun, and we got a ton of compliments on how great the music was! You were great! I will definately recommend you to all of my friends getting married!" "P.S. My mom (Caro Eyles) thought you were great too!"